PHOENIX, ARIZ., UNITED STATES, March 16, 2019 /EINPresswire.com/ -- Lerner and Rowe Gives Back (LRGB) is pleased to announce their foundation’s newest community partnership3 with Pass It On, a soccer nonprofit founded by Wade Crum, a 13-year-old soccer enthusiast and player. To kick off the partnership, LRGB committed to donating $5,000 to help support Crum’s goal to make it possible for every kid in Arizona to play soccer if they want too. The financial contribution has been slated to cover essential operational items and purchase soccer equipment collection bins. In turn, each bin will be strategically placed throughout the city to make it easier for other kids and adults to donate new and gently-used kid/teen size soccer clothes and equipment. Lerner and Rowe Gives Back encourages others to learn more about Pass It On and do what they can to help Pass It On’s efforts to give kids in need the opportunity to get involved and play. Visit PassItOnSoccer.net1, or email Wade Crum directly at wadecrum@passitonsoccer.net to learn more about Pass It On, how to donate equipment, or how to set up a donation drive. Lerner and Rowe Gives Back serves communities across that state of Arizona daily. Their mission is to make a difference in the lives of people in need. They hope to do this helping redirect at-risk youth towards activities that will help them grow and achieve more, as well and bringing comfort and assistance to people who need it most. 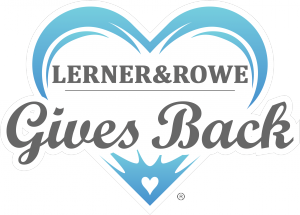 Learn more about how Lerner and Rowe Gives Back supports Arizona communities and organizations at lernerandrowegivesback.com2.